Crazy isn't the best word to describe how besotted I am with highlighter. 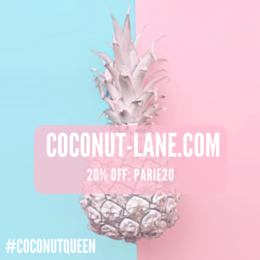 Over the last few months, its all I've wanted to buy, wear and now share with you all! All through summer and now through winter, the only thing I will definitely be wearing everyday is highlighter, the look of it is just gorgeous! 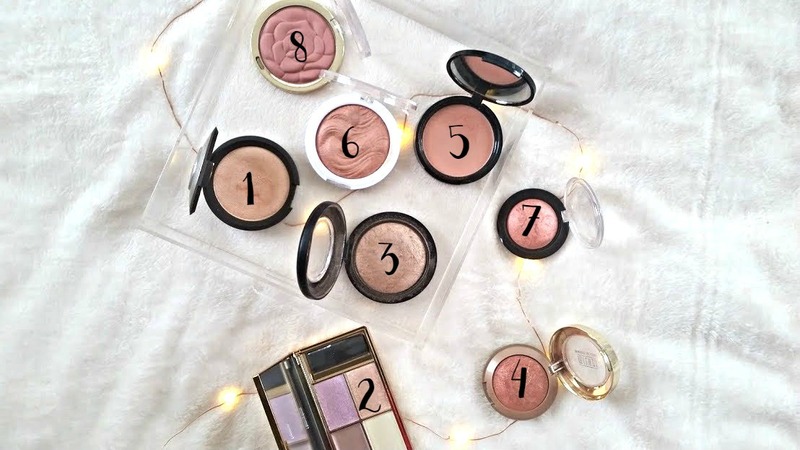 In this post I have narrowed it down to my top 8 favourites, in that 8 three are actually blushes and 1 of the 3 is purely a blush but I use it in a certain way. To make it easier to follow, they countdown from 1 -8 so you can skip to a certain one if that catches your eye. This is a blush not a highlighter per se but its a gorgeous sheer blush to start out with. Applying this on the top of your cheeks looks stunning and so does layering other products on top too. Milani makes another appearance in this top 8 further down, its no surprise because the formula of their cheek products are out of this world. Another budget brand that delivers some amazing products, this undress your skin highlighter now comes in 4 shades and all 4 are insane. They never seem to be in stock in my local Superdrug but if they are in yours then try them now! Would you believe that I've had this compact for over a year and its still going strong? It never seems to end! It doesn't last very long and you need to apply quite a bit of the pink shimmer one for it to show up on my dark skin but still amazing. NYX brand this as a bronzer the amount of shimmer, glitter and sparkle it has does not make it a bronzer in my eyes and there's even a pink shade? How can you call this a bronzer is beyond me. Instead I use it on my cheeks, nose and my eyes as a highlighter, it has this sort of iridescent look to it and looks simply wonderful. Another blush that has so much glitter in it I can't apply it on my cheeks without looking like a clown. But a slight dusting on my cheek bones looks perfect, its the perfect mix between pink and gold and when you wear it alone the result is incredible. I've also tried this as a highlighter on my eyes and it looks gorgeous, great if you ever need a multi-purpose product. Now we're getting serious and into the top 3, the ones that I would repurchase in a heartbeat. Soft and Gentle is a firm favourite among many beauty lovers and so it should be. The entire minzeralize skin finish range is to die for, they are all mineral powders with a metallic finish and in my opinion great for all skin tones. I have an Asian skin tone and it looks amazing and I have a friend with pale skin who wears it to death - both end of the skin tone scale and it works. Side note, it lasts forever! I've had this a whole year and must have used it constantly and its still going - the champagne glow that it gives is beyond perfection. I debated over whether or not to include this in the post because its only been mine for a few weeks but when you reach for the same product all the time and take it on holiday with you after owning it for 4 days, surely that means something? The Sleek highlighting palettes have taken over the world, everyone and anyone is talking about them - if you are yet to try the palette the I suggest you do now. The 2 powder shades are my ultimate favourites, they look beautiful, last all day and the pigmentation of them is insane. I love layering the purple one on top of the MR blush - its stunning! Another highlighter that hasn't been in my possession for very long but it will be with me forever and ever. Jaclyn Hill is the queen b of highlighting and this creation of hers is heavenly. It trumps the other 7 in this post because of the formula, its buttery, silky, pigmented and oh just so perfect. I'm wanting to try everything else from her range before they get rid of it because she has done a damn good job. Champagne Pop has a pearly glow to it and looks divine on the skin. Go buy this right now, like right now. 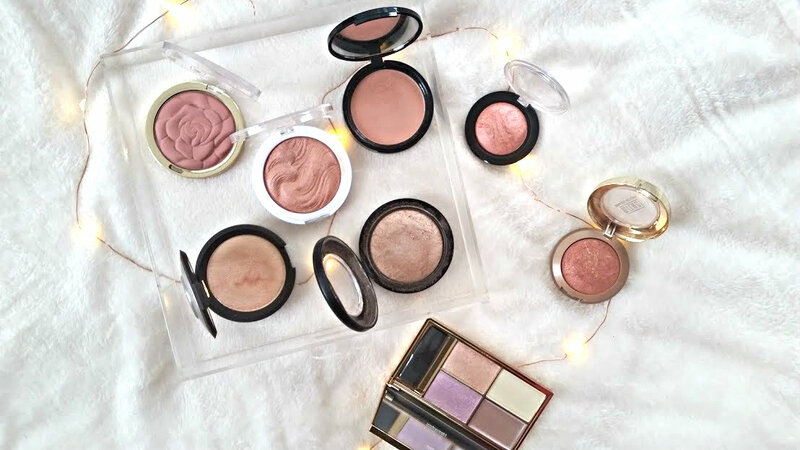 What are your favourite highlighters for that gorgeous glow?